Books and Special Issues Order from amazon.com New! Artificial Intelligence and Symbolic Computation - AISSC 2018 Proceedings (edited with Jacques Fleuriot and Jacques Calmet). LNAI 11110. Springer Nature, Switzerland, 2018. Program Verification, Automated Debugging and Symbolic Computation - Special issue of the Journal of Symbolic Computation (edited with Tudor Jebelean and Wei Li). Elsevier, London, 2017. Geometric Computation - Special issue of Mathematics in Computer Science (edited with J. Rafael Sendra and Jing Yang). Birkhäuser/Springer, Basel, 2016. Mathematics, Data and Knowledge - Special focus of Mathematics in Computer Science (edited with Xiaoyu Chen and Xiangliang Zhang). Birkhäuser/Springer, Basel, 2013. 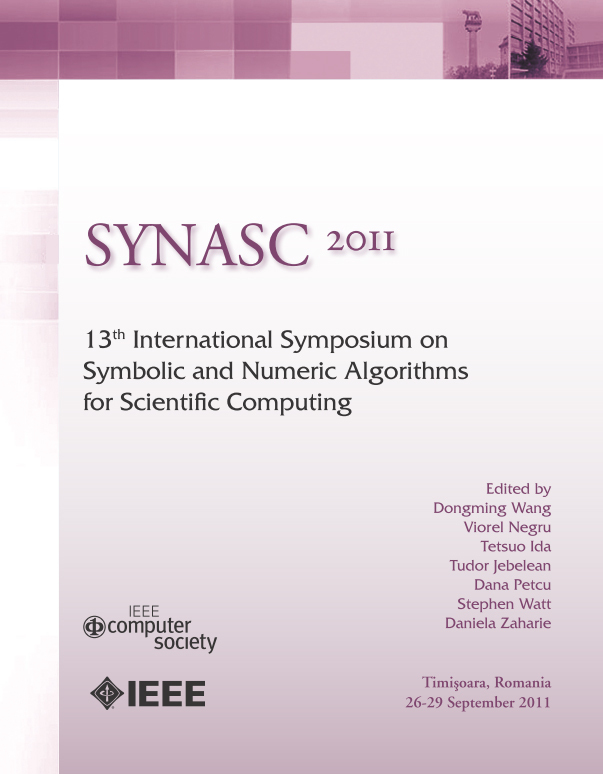 Proceedings of the 13th International Symposium on Symbolic and Numeric Algorithms for Scientific Computing (SYNASC 2011) (edited with Viorel Negru, Tetsuo Ida, Tudor Jebelean, Dana Petcu, Stephen Watt, and Daniela Zaharie). IEEE Computer Society, Los Alamitos, CA, 2012. Polynomial Algebra (in Chinese, with Chenqi Mou, Xiaoliang Li, Jing Yang, Meng Jin, and Yanli Huang). Higher Education Press, Beijing, 2011. Foundations of Software - Special focus of Frontiers of Computer Science in China (edited with Tetsuo Ida and Qingshan Jiang). Higher Education Press, Beijing and Springer, Berlin, 2008. 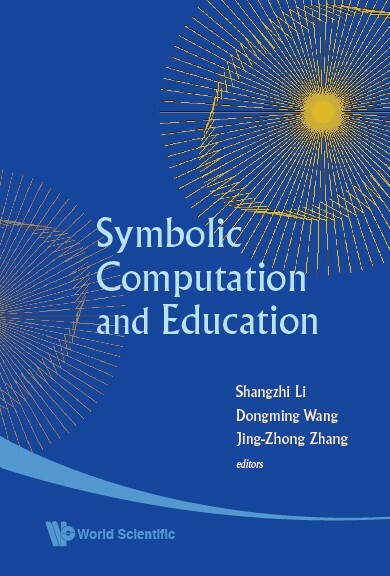 Symbolic Computation and Education (edited with Shangzhi Li and Jing-Zhong Zhang). World Scientific Publishing Co., Singapore New Jersey, 2007. 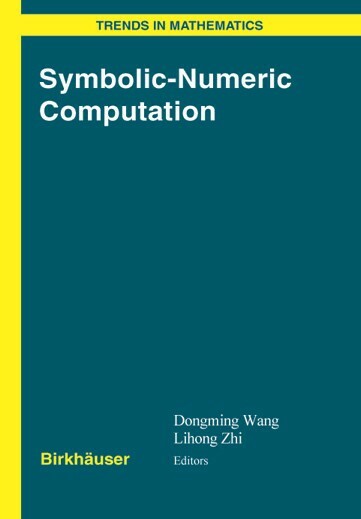 Symbolic and Numeric Computation - Special issue of Mathematics in Computer Science (edited with Lihong Zhi). Birkhäuser, Basel Boston, 2007. Gröbner Bases in Symbolic Analysis (edited with Markus Rosenkranz). de Gruyter, Berlin New York, 2007. 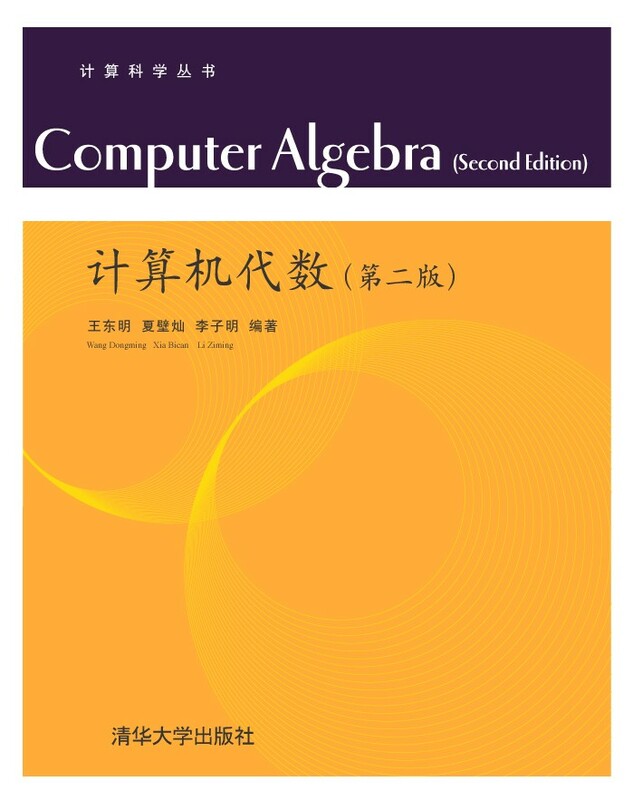 Computer Algebra (2nd edition, in Chinese, with Bican Xia and Ziming Li). Tsinghua University Press, Beijing, 2007. Symbolic-Numeric Computation (edited with Lihong Zhi). Birkhäuser, Basel Boston, 2007. Artificial Intelligence and Symbolic Computation - AISC 2006 Proceedings (edited with Jacques Calmet and Tetsuo Ida). LNAI 4120. Springer-Verlag, Berlin Heidelberg, 2006. Automated Deduction in Geometry - ADG 2004 Revised Papers (edited with Hoon Hong). LNAI 3763. Springer-Verlag, Berlin Heidelberg, 2006. 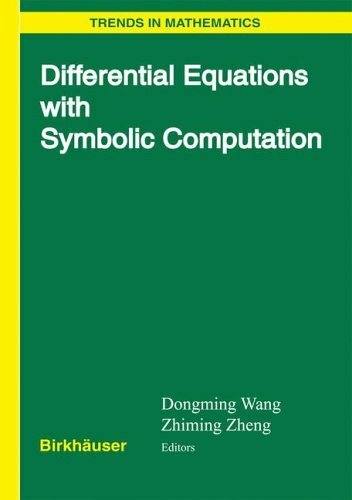 Differential Equations with Symbolic Computation (edited with Zhiming Zheng). Birkhäuser, Basel Boston, 2005. Computer Algebra (in Chinese, with Bican Xia). Tsinghua University Press, Beijing, 2004. Geometric Computation (edited with Falai Chen). World Scientific Publishing Co., Singapore New Jersey, 2004. Elimination Practice: Software Tools and Applications. Imperial College Press, London, 2004. 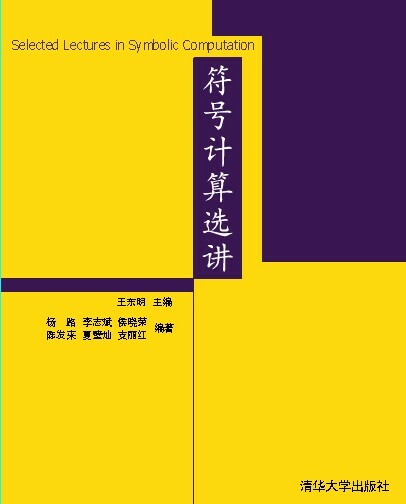 Selected Lectures in Symbolic Computation (edited in Chinese). Tsinghua University Press, Beijing, 2003. Elimination Methods with Applications (in Chinese). Science Press, Beijing, 2002. 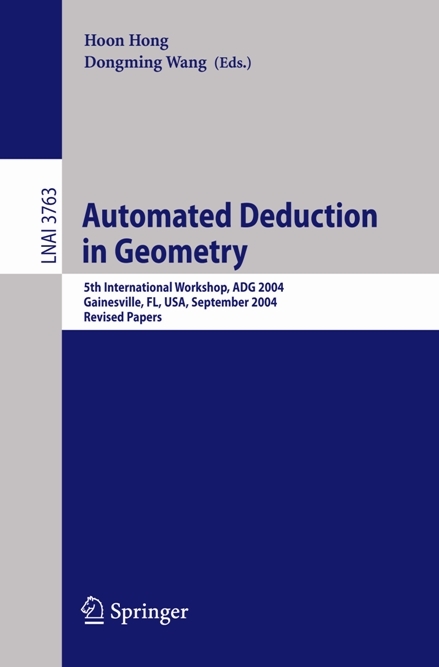 Automated Deduction in Geometry - ADG 2000 Revised Papers (edited with Jürgen Richter-Gebert). LNAI 2061. Springer-Verlag, Berlin Heidelberg, 2001. Elimination Methods. Springer-Verlag, Wien New York, 2001. 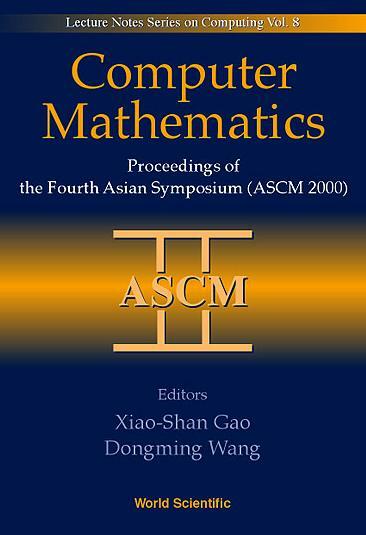 Computer Mathematics - Proceedings of the Fourth Asian Symposium (ASCM 2000) (edited with Xiao-Shan Gao). World Scientific Publishing Co., Singapore New Jersey, 2000. Mathematics Mechanization and Applications (edited with Xiao-Shan Gao). Academic Press, London, 2000. Proceedings of the Fourth Asian Technology Conference in Mathematics (edited with Wei-Chi Yang, Sung-Chi Chu, and Gary Fitz-Gerald). ATCM, Inc., USA, 1999. 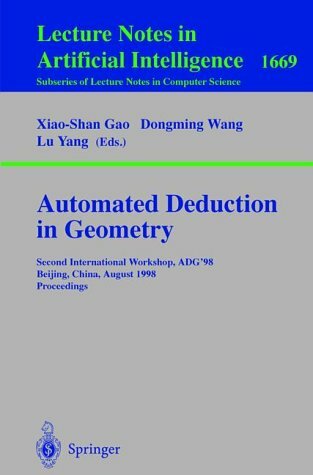 Automated Deduction in Geometry - ADG '98> Proceedings (edited with Xiao-Shan Gao and Lu Yang). LNAI 1669. Springer-Verlag, Berlin Heidelberg, 1999. Polynomial Elimination: Algorithms and Applications - Special issue of the Journal of Symbolic Computation (edited with Michael Kalkbrener). Academic Press, London, 1999. Computer Algebra and Automated Theorem Proving - Special issue of the Journal of Automated Reasoning (edited with Deepak Kapur). Kluwer Academic Publishers, Boston Dordrecht London, 1998. Automated Deduction in Geometry (edited in cooperation with Ricardo Caferra, Luis Fariñas del Cerro, and He Shi). LNAI 1360. Springer-Verlag, Berlin Heidelberg, 1997. Automated Practical Reasoning: Algebraic Approaches (edited with Jochen Pfalzgraf). Springer-Verlag, Wien New York, 1995. Algebraic Approaches to Geometric Reasoning - Special issue of the Annals of Mathematics and Artificial Intelligence (edited with Hoon Hong and Franz Winkler). Baltzer Science Publishers, Amsterdam, 1995. Mechanical Theorem Proving in Geometries: Basic Principles by Wen-tsün Wu (translated from the Chinese with Xiaofan Jin). Springer-Verlag, Wien New York, 1994. Characteristic Decomposition: From Regular Sets to Normal Sets (with Chenqi Mou). Journal of Systems Science and Complexity 32(1) (2019) 37-46. Retrieving Geometric Information from Images: The Case of Hand-drawn Diagrams (with Xiaoyu Chen and Dan Song). Data Mining and Knowledge Discovery 31(4) (2017) 934-971. On the Connection Between Ritt Characteristic Sets and Buchberger-Gröbner Bases. Mathematics in Computer Science 10(4) (2016) 479-492. Automated Generation of Geometric Theorems from Images of Diagrams (with Xiaoyu Chen and Dan Song). Annals of Mathematics and Artificial Intelligence 74 (2015) 333-358. Computing Equilibria of Semi-algebraic Economies Using Triangular Decomposition and Real Solution Classification (with Xiaoliang Li). Journal of Mathematical Economics 54 (2014) 48-58. Formalization and Specification of Geometric Knowledge Objects (with Xiaoyu Chen). Mathematics in Computer Science 7(4) (2013) 439-454. A Framework for Improving Uniformity of Parameterizations of Curves (with Hoon Hong and Jing Yang). Science China Information Sciences 56(10) (2013) 108101:1-108101:22. Improving Angular Speed Uniformity by Reparametrization (with Hoon Hong and Jing Yang). Computer Aided Geometric Design 30(7) (2013) 636-652. Decomposing Polynomial Sets into Simple Sets over Finite Fields: The Positive-dimensional Case (with Xiaoliang Li and Chenqi Mou). Theoretical Computer Science 468 (2013) 102-113. A New Algorithmic Scheme for Computing Characteristic Sets (with Meng Jin and Xiaoliang Li). Journal of Symbolic Computation 50 (2013) 431-449. Algebraic Analysis of Stability and Bifurcation of a Self-assembling Micelle System (with Wei Niu). Applied Mathematics and Computation 219(1) (2012) 108-121. Algebraic Stability Criteria and Symbolic Derivation of Stability Conditions for Feedback Control Systems. International Journal of Control 85(10) (2012) 1414-1421. Management of Geometric Knowledge in Textbooks (with Xiaoyu Chen). Data & Knowledge Engineering 73 (2012) 43-57. Computing Intersection and Self-intersection Loci of Parametrized Surfaces Using Regular Systems and Gröbner Bases (with Yanli Huang). Computer Aided Geometric Design 28(9) (2011) 566-581. Stability Analysis for Discrete Biological Models Using Algebraic Methods (with Xiaoliang Li, Chenqi Mou, and Wei Niu). Mathematics in Computer Science 5(3) (2011) 247-262. Solution Formulas for Cubic Equations Without or With Constraints (with Hoon Hong and Ting Zhao). Journal of Symbolic Computation 46(8) (2011) 904-918. Algebraic Analysis of Stability and Bifurcation for Nonlinear Flight Dynamics. The Aeronautical Journal 115(1168) (2011) 345-349. Decomposing Polynomial Sets into Simple Sets over Finite Fields: The Zero-dimensional Case (with Xiaoliang Li and Chenqi Mou). Computers and Mathematics with Applications 60(11) (2010) 2983-2997. Algebraic Approaches to Stability Analysis of Biological Systems (with Wei Niu). Mathematics in Computer Science 1(3) (2008) 507-539. On the Design and Implementation of a Geometric-Object-Oriented Language (with Tielin Liang). Frontiers of Computer Science in China 1(2) (2007) 180-190. A Simple Method for Implicitizing Rational Curves and Surfaces. Journal of Symbolic Computation 38(1) (2004) 899-914. "Russian Killer" No. 2: A Challenging Geometric Theorem with Human and Machine Proofs (with Xiaorong Hou, Hongbo Li, and Lu Yang). The Mathematical Intelligencer 23(1) (2001) 9-15. Computing Triangular Systems and Regular Systems. Journal of Symbolic Computation 30(2) (2000) 221-236. A Class of Cubic Systems with Two Centers or Two Foci (with Lansun Chen and Zhengyi Lu). Journal of Mathematical Analysis and Applications 242(2) (2000) 154-163. Combining Clifford Algebraic Computing and Term-Rewriting for Geometric Theorem Proving (with Stéphane Fèvre). Fundamenta Informaticae 39(1-2) (1999) 85-104. Polynomial Systems from Certain Differential Equations. Journal of Symbolic Computation 28(1-2) (1999) 303-315. Coherent, Regular and Simple Systems in Zero Decompositions of Partial Differential Systems (invited paper, with Ziming Li). Systems Science and Mathematical Sciences 12(Suppl.) (1999) 43-60. Unmixed and Prime Decomposition of Radicals of Polynomial Ideals. ACM SIGSAM Bulletin 32(4) (1998) 2-9. Decomposing Polynomial Systems into Simple Systems. Journal of Symbolic Computation 25(3) (1998) 295-314. An Elimination Method for Differential Polynomial Systems I. Systems Science and Mathematical Sciences 9(3) (1996) 216-228. Solving Polynomial Equations: Characteristic Sets and Triangular Systems. Mathematics and Computers in Simulation 42(4-6) (1996) 339-351. A Method for Proving Theorems in Differential Geometry and Mechanics. Journal of Universal Computer Science 1(9) (1995) 658-673. Elimination Procedures for Mechanical Theorem Proving in Geometry. Annals of Mathematics and Artificial Intelligence 13(1-2) (1995) 1-24. Differentiation and Integration of Indefinite Summations with Respect to Indexed Variables - Some Rules and Applications. Journal of Symbolic Computation 18(3) (1994) 249-263. An Elimination Method for Polynomial Systems. Journal of Symbolic Computation 16(2) (1993) 83-114. Computer Aided Analysis and Derivation for Artificial Neural Systems (with Bernd Schürmann). IEEE Transactions on Software Engineering 18(8) (1992) 728-735. Irreducible Decomposition of Algebraic Varieties via Characteristic Sets and Gröbner Bases. Computer Aided Geometric Design 9(6) (1992) 471-484. Machine Treatment of Problems for a Class of Differential Equations (in Chinese). Acta Mathematica Scientia 12(4) (1992) 389-396. The Structure of LaSalle's Invariant Set of Lotka-Volterra Systems (with Li Liu and Zhengyi Lu). Science in China (Ser. A) 34(7) (1991) 783-790. Mechanical Manipulation for a Class of Differential Systems. Journal of Symbolic Computation 12(2) (1991) 233-254. Mechanical Manipulation for LaSalle's Invariant Sets of Lotka-Volterra Systems (extended abstract, with Li Liu and Zhengyi Lu). Advances in Mathematics 19(2) (1990) 249-250. On the Conditions of Kukles for the Existence of a Centre (with Xiaofan Jin). Bulletin of London Mathematical Society 22(1) (1990) 1-4. A Class of Cubic Differential Systems with 6-tuple Focus. Journal of Differential Equations 87(2) (1990) 305-315. A Program for Computing the Liapunov Functions and Liapunov Constants in Scratchpad II. ACM SIGSAM Bulletin 23(4) (1989) 25-31. A New Theorem Discovered by Computer Prover. Journal of Geometry 36(1-2) (1989) 173-182. Proving-by-Examples Method and Inclusion of Varieties. 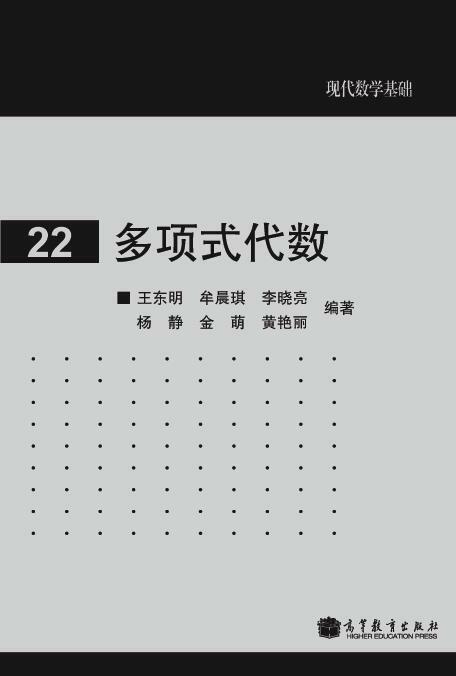 Kexue Tongbao (Science Bulletin) 33(24) (1988) 2015-2018. A Mechanical Proving System for Constructible Theorems in Elementary Geometry (in Chinese, with Sen Hu). J. Sys. Sci. & Math. Scis. 7(2) (1987) 163-172. Fast Factorization of Polynomials over Rational Number Field or Its Extension Fields (with Sen Hu). Kexue Tongbao 31(2) (1986) 150-156. LaText: A Linear Algebra Textbook System (with Xiaoyu Chen, Haotian Shuai, and Jing Yang). In: Artificial Intelligence and Symbolic Computation (AISC 2018) (J. Fleuriot, D. Wang, and J. Calmet, eds. ), LNCS 11110, Springer Nature, Switzerland, 2018, pp. 209-214. Searching for Geometric Theorems Using Features Retrieved from Diagrams (with Wenya An and Xiaoyu Chen). In: Mathematical Aspects of Computer and Information Sciences (MACIS 2015) (I. S. Kotsireas, S. M. Rump, and C. K. Yap, eds. ), LNCS 9582, Springer, Cham Heidelberg, 2016, pp. 383-397. Discovering Geometric Theorems from Scanned and Photographed Images of Diagrams (with Xiaoyu Chen and Dan Song). In: Automated Deduction in Geometry (F. Botana and P. Quaresma, eds. ), LNAI 9201, Springer, Cham Heidelberg, 2015, pp. 149-165. OpenGeo: An Open Geometric Knowledge Base (with Wenya An, Xiaoyu Chen, Lei Jiang, and Dan Song). In: Proceedings of the Fourth International Congress on Mathematical Software (ICMS 2014) (Seoul, Korea, August 5-9, 2014), LNCS 8592, Springer-Verlag, Berlin Heidelberg, 2014, pp. 240-245. ImUp: A Maple Package for Uniformity-Improved Reparameterization of Plane Curves (with Hoon Hong and Jing Yang). In: Proceedings of the Tenth Asian Symposium on Computer Mathematics (ASCM 2012) (Beijing, China, October 26-28, 2012), Springer-Verlag, Berlin Heidelberg, 2014, pp. 437-451. Improving Angular Speed Uniformity by C¹ Piecewise Reparameterization (with Hoon Hong and Jing Yang). In: Automated Deduction in Geometry (T. Ida and J. Fleuriot, eds. ), LNAI 7993, Springer-Verlag, Berlin Heidelberg, 2013, pp. 33-47. Improving Angular Speed Uniformity by Optimal C⁰ Piecewise Reparameterization (with Hoon Hong and Jing Yang). In: Proceedings of the 14th International Workshop on Computer Algebra in Scientific Computing (CASC 2012) (Maribor, Slovenia, September 3-6, 2012), LNCS 7442, Springer-Verlag, Berlin Heidelberg, 2012, pp. 349-360. Open Geometry Textbook: A Case Study of Knowledge Acquisition via Collective Intelligence (project description, with Xiaoyu Chen, Wei Li, and Jie Luo). In: Intelligent Computer Mathematics - CICM 2012 Proceedings (J. Jeuring, J. A. Campbell, J. Carette, G. Dos Reis, P. Sojka, M. Wenzel, and V. Sorge, eds. ), LNAI 7362, Springer-Verlag, Berlin Heidelberg, 2012, pp. 432-437. Real Solution Formulas of Cubic and Quartic Equations Applied to Generate Dynamic Diagrams with Inequality Constraints (with Philippe Aubry, Hoon Hong, and Ting Zhao). In: Proceedings of the 27th ACM Symposium on Applied Computing (SAC 2012) (Riva del Garda, Italy, March 26-30, 2012), ACM Press, New York, 2012, pp. 94-101. On the Design and Implementation of a Geometric Knowledge Base (with Xiaoyu Chen and Ying Huang). In: Automated Deduction in Geometry (T. Sturm and C. Zengler, eds. ), LNAI 6301, Springer-Verlag, Berlin Heidelberg, 2011, pp. 22-41. Computing Self-intersection Loci of Parametrized Surfaces Using Regular Systems and Gröbner Bases (with Yanli Huang). In: Proceedings of the 11th International Symposium on Symbolic and Numeric Algorithms for Scientific Computing (SYNASC 2009) (Timisoara, Romania, September 26-29, 2009), IEEE Computer Society, Los Alamitos, CA, 2009, pp. 28-36. Basic Elements of Computer Geometry (invited paper). In: Proceedings of the Tunisia-Japan Workshop on Symbolic Computation in Software Science (SCSS 2009) (Gammarth, Tunisia, September 22-24, 2009) (A. Bouhoula and T. Ida, eds. ), EasyChair, 2009, pp. 2-12. Algebraic Analysis of Bifurcation and Limit Cycles for Biological Systems (with Wei Niu). In: Proceedings of the Third International Conference on Algebraic Biology (AB 2008) (Hagenberg, Austria, July 31 - August 2, 2008), LNCS 5147, Springer-Verlag, Berlin Heidelberg, 2008, pp. 156-171. Towards an Electronic Geometry Textbook (with Xiaoyu Chen). In: Automated Deduction in Geometry (F. Botana and T. Recio, eds. ), LNAI 4869, Springer-Verlag, Berlin Heidelberg, 2007, pp. 1-23. Solving Dynamic Geometric Constraints Involving Inequalities (with Hoon Hong, Liyun Li, and Tielin Liang). In: Artificial Intelligence and Symbolic Computation - AISC 2006 Proceedings (J. Calmet, T. Ida, and D. Wang, eds. ), LNAI 4120, Springer-Verlag, Berlin Heidelberg, 2006, pp. 181-195. Uniform Gröbner Bases for Ideals Generated by Polynomials with Parametric Exponents (with Wei Pan). In: Proceedings of the 2006 International Symposium on Symbolic and Algebraic Computation (ISSAC 2006) (Genova, Italy, July 9-12, 2006), ACM Press, New York, 2006, pp. 269-276. Towards a Geometric-Object-Oriented Language (with Tielin Liang). In: Automated Deduction in Geometry (H. Hong and D. Wang, eds. ), LNAI 3763, Springer-Verlag, Berlin Heidelberg, 2006, pp. 130-155. Computational Polynomial Algebra and Its Biological Applications (invited tutorial). In: Algebraic Biology 2005 - Computer Algebra in Biology (Proceedings of the First International Conference, Tokyo, Japan, November 28-30, 2005) (H. Anai and K. Horimoto, eds. ), Universal Academy Press, Inc., Tokyo, 2005, pp. 127-137. Algebraic Analysis of Stability for Some Biological Systems (with Bican Xia). In: Algebraic Biology 2005 - Computer Algebra in Biology (Proceedings of the First International Conference, Tokyo, Japan, November 28-30, 2005) (H. Anai and K. Horimoto, eds. ), Universal Academy Press, Inc., Tokyo, 2005, pp. 75-83. Stability Analysis of Biological Systems with Real Solution Classification (with Bican Xia). In: Proceedings of the 2005 International Symposium on Symbolic and Algebraic Computation (ISSAC 2005) (Beijing, China, July 24-27, 2005), ACM Press, New York, 2005, pp. 354-361. The Projection Property of Regular Systems and Its Application to Solving Parametric Polynomial Systems. In: Algorithmic Algebra and Logic - Proceedings of the A3L 2005 (A. Dolzmann, A. Seidl, and T. Sturm, eds. ), Herstellung und Verlag, Norderstedt, 2005, pp. 269-274. Implicitization and Offsetting via Regular Systems. In: Geometric Computation (F. Chen and D. Wang, eds. ), World Scientific, Singapore New Jersey, 2004, pp. 156-176. GEOTHER 1.1: Handling and Proving Geometric Theorems Automatically. In: Automated Deduction in Geometry (F. Winkler, ed. ), LNAI 2930, Springer-Verlag, Berlin Heidelberg, 2004, pp. 194-215. Computer Algebra (in Chinese, with Bican Xia). Chapter 1 in: Selected Lectures in Symbolic Computation (D. Wang, ed. ), Tsinghua University Press, Beijing, 2003, pp. 1-55. Automated Generation of Diagrams with Maple and Java. In: Algebra, Geometry, and Software Systems (M. Joswig and N. Takayama, eds. ), Springer-Verlag, Berlin Heidelberg, 2003, pp. 277-287. Epsilon: A Library of Software Tools for Polynomial Elimination. In: Mathematical Software - Proceedings of the First International Congress of Mathematical Software (ICMS 2002) (A. M. Cohen, X.-S. Gao, and N. Takayama, eds. ), World Scientific, Singapore New Jersey, 2002, pp. 379-389. A Generalized Algorithm for Computing Characteristic Sets. In: Computer Mathematics - Proceedings of the Fifth Asian Symposium (ASCM 2001) (K. Shirayanagi and K. Yokoyama, eds. ), World Scientific, Singapore New Jersey, 2001, pp. 165-174. Reasoning about Surfaces Using Differential Zero and Ideal Decomposition (with Philippe Aubry). In: Automated Deduction in Geometry (J. Richter-Gebert and D. Wang, eds. ), LNAI 2061, Springer-Verlag, Berlin Heidelberg, 2001, pp. 154-174. Elimination Theory, Methods, and Practice (invited paper). In: Mathematics and Mathematics-Mechanization (D. Lin, W. Li, and Y. Yu, eds. ), Shandong Education Publishing House, Jinan, 2001, pp. 91-137. A Method for Multivariate Polynomial Factorization over Successive Algebraic Extension Fields (with Dongdai Lin). In: Mathematics and Mathematics-Mechanization (D. Lin, W. Li, and Y. Yu, eds. ), Shandong Education Publishing House, Jinan, 2001, pp. 138-172. Geometric Reasoning with Geometric Algebra (invited paper). In: Geometric Algebra with Applications in Science and Engineering (E. Bayro-Corrochano and G. Sobczyk, eds. ), Birkhäuser, Boston, 2001, pp. 89-109. Subresultants with the Bézout Matrix (with Xiaorong Hou). In: Computer Mathematics - Proceedings of the Fourth Asian Symposium (ASCM 2000) (X.-S. Gao and D. Wang, eds. ), World Scientific, Singapore New Jersey, 2000, pp. 19-28. Some Algorithms for Zero Decomposition of Polynomial Systems. In: Mathematics Mechanization and Applications (X.-S. Gao and D. Wang, eds. ), Academic Press, London, 2000, pp. 43-73 [A French version entitled "Algorithmes d'élimination pour systèmes de polynômes" is available as http://www-salsa.lip6.fr/~wang/resume_etendu.ps.gz]. Geometric Theorem Provers and Algebraic Equation Solvers (with Shang-Ching Chou, Xiao-Shan Gao, Zhuojun Liu, and Ding-Kang Wang). In: Mathematics Mechanization and Applications (X.-S. Gao and D. Wang, eds. ), Academic Press, London, 2000, pp. 491-505. Decomposing Algebraic Varieties. In: Automated Deduction in Geometry (X.-S. Gao, D. Wang, and L. Yang, eds. ), LNAI 1669, Springer-Verlag, Berlin Heidelberg, 1999, pp. 180-206. Clifford Term Rewriting for Geometric Reasoning in 3D (with Thierry Boy de la Tour and Stéphane Fèvre). In: Automated Deduction in Geometry (X.-S. Gao, D. Wang, and L. Yang, eds. ), LNAI 1669, Springer-Verlag, Berlin Heidelberg, 1999, pp. 130-155. Combining Algebraic Computing and Term-Rewriting for Geometry Theorem Proving (with Stéphane Fèvre). In: Proceedings of the Fourth International Conference on Artificial Intelligence and Symbolic Computation (AISC '98) (Plattsburgh, USA, September 16-18, 1998), LNAI 1476, Springer-Verlag, Berlin Heidelberg, pp. 145-156. Algebraic Factorization Applied to Geometric Problems (with Lihong Zhi). In: Proceedings of the Third Asian Symposium on Computer Mathematics (ASCM '98) (Lanzhou, China, August 6-8, 1998), Lanzhou University Press, Lanzhou, pp. 23-36. Proving Geometric Theorems Using Clifford Algebra and Rewrite Rules (with Stéphane Fèvre). In: Proceedings of the 15th International Conference on Automated Deduction (CADE-15) (Lindau, Germany, July 5-10, 1998), LNAI 1421, Springer-Verlag, Berlin Heidelberg, pp. 17-32. Gröbner Bases Applied to Geometric Theorem Proving and Discovering (invited tutorial). In: Gröbner Bases and Applications (Proceedings of the International Conference "33 Years of Gröbner Bases", B. Buchberger and F. Winkler, eds. ), Cambridge University Press, Cambridge, 1998, pp. 281-301. Clifford Algebraic Calculus for Geometric Reasoning with Application to Computer Vision. In: Automated Deduction in Geometry (D. Wang, ed. ), LNAI 1360, Springer-Verlag, Berlin Heidelberg, 1997, pp. 115-140. Geometry Machines: From AI to SMC (invited paper). In: Proceedings of the Third International Conference on Artificial Intelligence and Symbolic Mathematical Computation (AISMC-3) (Steyr, Austria, September 23-25, 1996), LNCS 1138, Springer-Verlag, Berlin Heidelberg, pp. 213-239. GEOTHER: A Geometry Theorem Prover. In: Proceedings of the 13th International Conference on Automated Deduction (CADE-13) (New Brunswick, USA, July 30 - August 3, 1996), LNAI 1104, Springer-Verlag, Berlin Heidelberg, pp. 166-170. Geometry Theorem Proving with Existing Technology. In: Proceedings of the First Asian Technology Conference in Mathematics (ATCM '95) (Singapore, December 18-21, 1995), pp. 561-570. A Method for Solving Algebraic Systems Based on Subresultant PRS. In: Proceedings of the Asian Symposium on Computer Mathematics (ASCM '95) (Beijing, China, August 18-20, 1995), Scientists Inc., Tokyo, pp. 55-69. Zero Decomposition for Theorem Proving in Geometry (extended abstract). In: Electronic Proceedings of the First International IMACS Conference on Applications of Computer Algebra (Albuquerque, USA, May 16-20, 1995), available via WWW (http://math.unm.edu/ACA/1995.html). Reasoning about Geometric Problems Using an Elimination Method. In: Automated Practical Reasoning: Algebraic Approaches (J. Pfalzgraf and D. Wang, eds. ), Springer-Verlag, Wien New York, 1995, pp. 147-185. An Implementation of the Characteristic Set Method in Maple. In: Automated Practical Reasoning: Algebraic Approaches (J. Pfalzgraf and D. Wang, eds. ), Springer-Verlag, Wien New York, 1995, pp. 187-201. Algebraic Factoring and Geometry Theorem Proving. In: Proceedings of the 12th International Conference on Automated Deduction (CADE-12) (Nancy, June 28 - July 1, 1994), LNAI 814, Springer-Verlag, Berlin Heidelberg, pp. 386-400. An Elimination Method Based on Seidenberg's Theory and Its Applications. In: Computational Algebraic Geometry (F. Eyssette and A. Galligo, eds. ), Progress in Mathematics 109, Birkhäuser, Boston, 1993, pp. 301-328. Automatic Generation of C++ Code for Neural Network Simulation (with Stephan Dreiseitl). In: Proceedings of the International Workshop on Artificial Neural Networks (IWANN '93) (Sitges, Spain, June 9-11, 1993), LNCS 686, Springer-Verlag, Berlin Heidelberg, pp. 358-363. A Strategy for Speeding-up the Computation of Characteristic Sets. In: Proceedings of the 17th International Symposium on Mathematical Foundations of Computer Science (MFCS '92) (Prague, Czechoslovakia, August 24-28, 1992), LNCS 629, Springer-Verlag, Berlin Heidelberg, pp. 504-510. Some Improvements on Wu's Method for Solving Systems of Algebraic Equations. In: Proceedings of the 1992 International Workshop on Mathematics Mechanization (Beijing, China, July 16-18, 1992), International Academic Publishers, Beijing, pp. 89-100. Computer Algebra and Neurodynamics (with Bernd Schürmann). In: Proceedings of the "Arbeitsgespräch Physik und Informatik - Informatik und Physik" (Munich, Gerrmany, November 21-22, 1991), Springer-Verlag, Berlin Heidelberg, pp. 304-317. Computer Aided Investigations of Artificial Neural Systems (with Bernd Schürmann). In: Proceedings of the International Joint Conference on Neural Networks (IJCNN '91) (Singapore, November 18-21, 1991), IEEE, Inc., New York, pp. 2325-2330. On the Parallelization of Characteristic-Set-Based Algorithms. In: Proceedings of the First International ACPC Conference (Salzburg, Austria, September 30 - October 2, 1991), LNCS 591, Springer-Verlag, Berlin Heidelberg, pp. 338-349. A Toolkit for Manipulating Indefinite Summations with Application to Neural Networks (application report). In: Proceedings of the 1991 International Symposium on Symbolic and Algebraic Computation (ISSAC '91) (Bonn, Germany, July 15-17, 1991), ACM Press, New York, pp. 462-463. Full paper in ACM SIGSAM Bulletin 25(3) (1991) 18-27. On Wu's Method for Proving Constructive Geometric Theorems. In: Proceedings of the 11th International Joint Conference on Artificial Intelligence (IJCAI-89) (Detroit, USA, August 20-25, 1989), Morgan Kaufmann Publishers, Los Altos, pp. 419-424. Computer Algebraic Methods for Investigating Plane Differential Systems of Center and Focus Type. In: Computers and Mathematics (MIT, USA, June 13-17, 1989), Springer-Verlag, New York Berlin, pp. 91-99.